NEW YORK--(BUSINESS WIRE)--Feb. 27, 2019-- JetBlue (NASDAQ:JBLU), the top airline in Boston, today announced the next phase of growth at Logan International Airport (BOS) as it advances toward its goal of 200 daily departures in the coming years. Beginning this summer, JetBlue will add more flights on twelve popular routes while also expanding or adjusting schedules to offer hourly service to Washington, D.C. and the New York metro area. 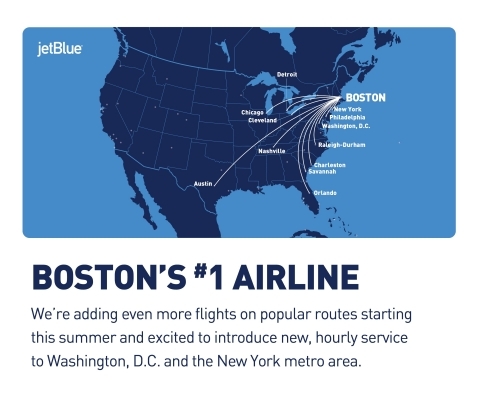 The move, which will benefit both leisure and business customers, is the latest in a series of growth announcements in Boston where JetBlue flies to more nonstop destinations, operates more flights and serves more travelers than any other airline. Later this year, JetBlue will take delivery of new, fuel-efficient A321 NEO aircraft, bringing another wave of cabin and comfort improvements along with additional range capabilities. Then, starting in 2020, JetBlue will also steadily replace its EMBRAER E190 fleet with the larger and more fuel-efficient Airbus A220, providing more seats in the market at a lower operating cost, and an improved onboard experience.